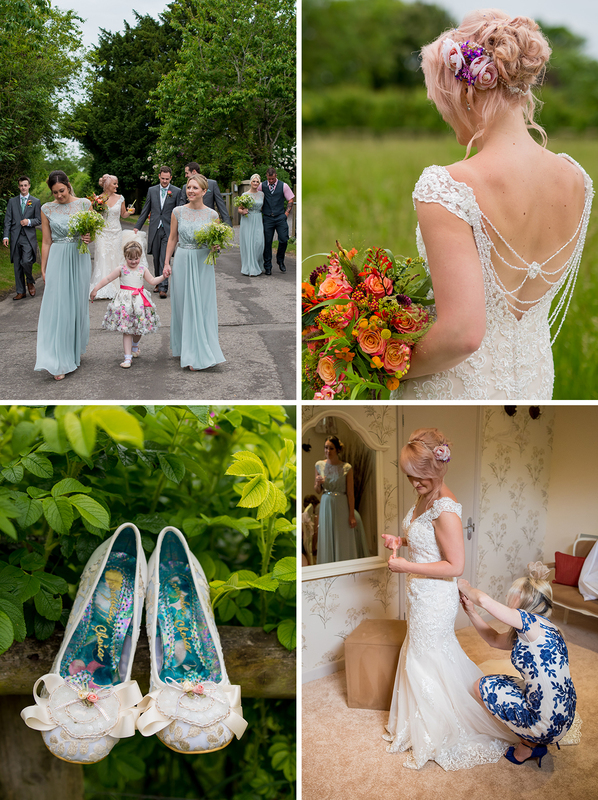 Jade and James’ wedding was a truly enjoyable family affair with lots of handmade details and thoughtful touches. Even the rain cleared up on the day so the celebrations were absolutely perfect. As soon as Jade and James turned into Clock Barn’s long drive, they both knew that they’d be booking Clock Barn for their wedding! “The barn felt warm and cosy which is exactly what we wanted. 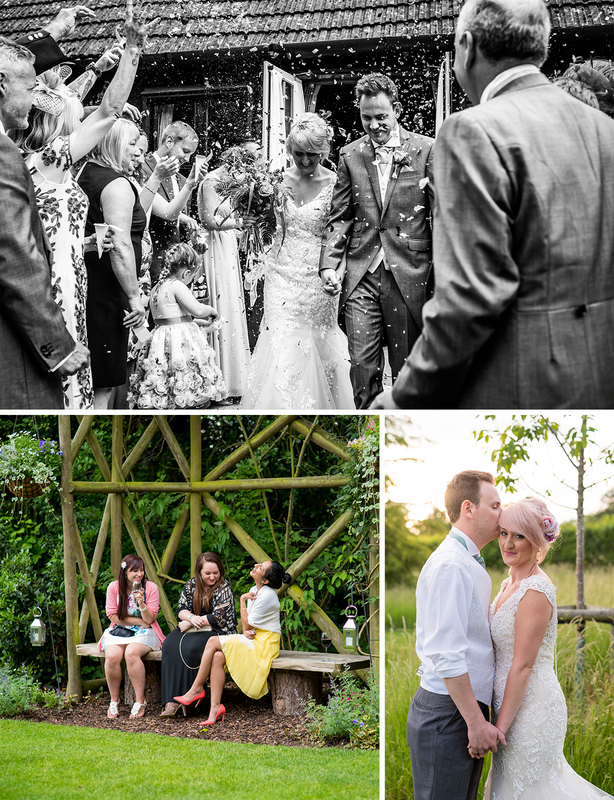 We also wanted a venue where we could enjoy being outside and the grounds at Clock Barn are absolutely beautiful.” – Jade. 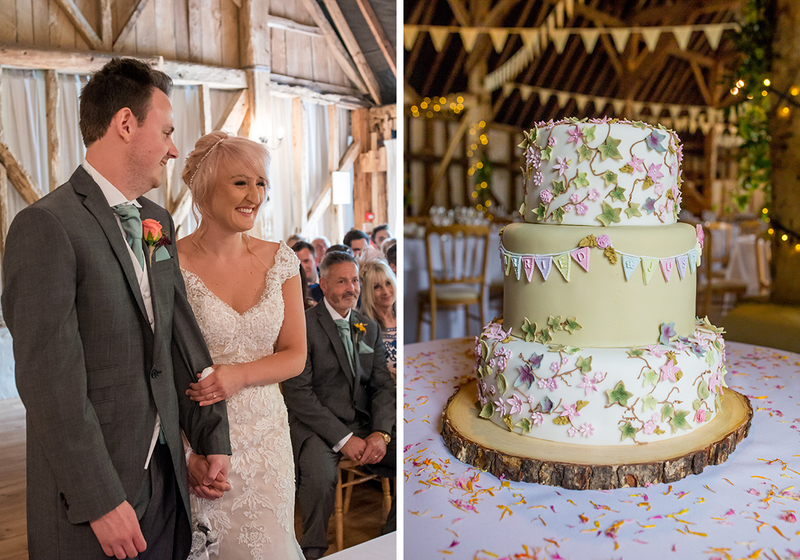 The couple wanted a rustic, country wedding and loved that at Clock Barn, they could add in pops of colour to really enhance the country look. “We worked with The White Horse Flower Company and wanted the flowers to add colour to the barn so we had a hanging flower installation behind the ceremony table which was unique and looked amazing. My bouquet was a loose, rustic, wispy design and I especially loved the Miss Piggy Roses!” – Jade. The couple chose table centres that included milk jugs and low wooden rustic boxes filled with flowers. The seating plan, made by Jade and her Mum, were more wooden boxes filled with flowers and the seating assignments were added in on wooden sticks. Jade’s stepdad made the carved wooden table numbers and the couple hired a personalised post-box for their cards. 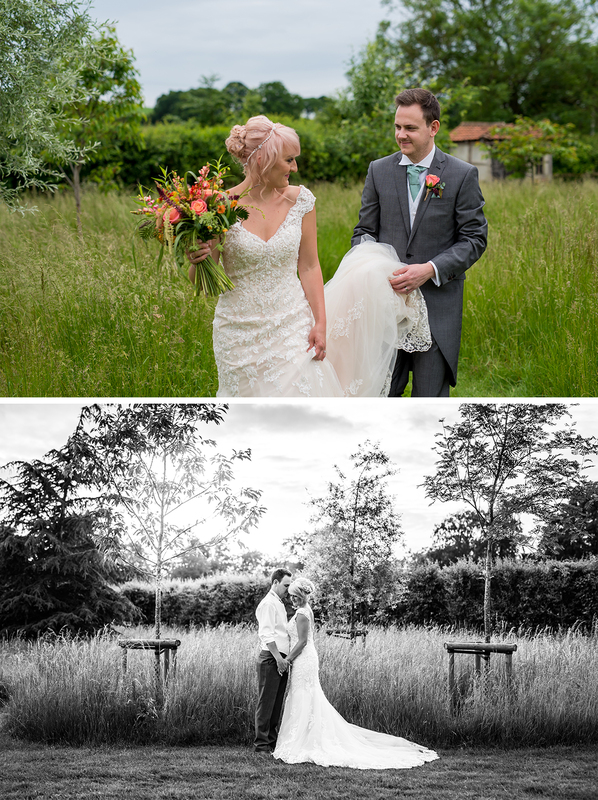 Jade wore a Ronald Joyce gown from Wedded Bliss in Dibden Purlieu. The sample dress had just arrived in the boutique when Jade was visiting and she fell for its long beaded back necklace and gold shimmer. She accessorised her dress with shoes from Irregular Choice, a crystal headband and diamond earrings. The bridesmaids wore dresses from Coast in Jade’s favourite colour of green that worked perfectly with the country theme. Macey, the little flower girl wore a super cute dress from Monsoon while groom James stepped out in a sharp suit and shoes from Ted Baker. Thankfully, the day’s drizzle had cleared by the time Jade and James arrived at Clock Barn and so the perfect summer drinks reception they had hoped for went ahead in the grounds. Guests enjoyed mini beef burgers, smoked salmon blinis and crispy risotto balls amongst other treats with white peach sangria and beer. After their three-course wedding breakfast, the couple treated their guests to more tempting delights with a whole spit-roasted pig with crackling during the evening. Jade’s Mum also made the couple’s wedding cake that included tiers of lemon, chocolate fudge and traditional fruitcake. There were favours of personalised seed packets and mini jars of jam, again made by Jade and her Mum. The couple also bought a sweetie cart to the wedding and that proved to be very popular! 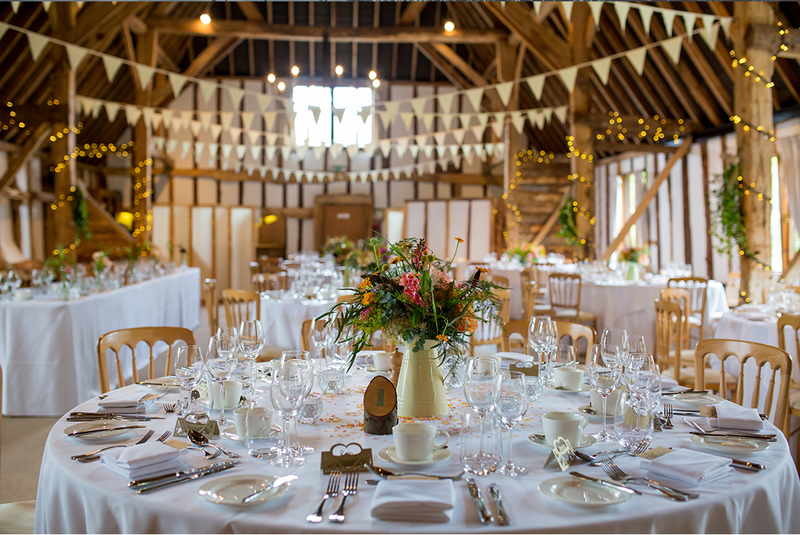 Planning a spring wedding at this beautiful wedding venue in Hampshire? 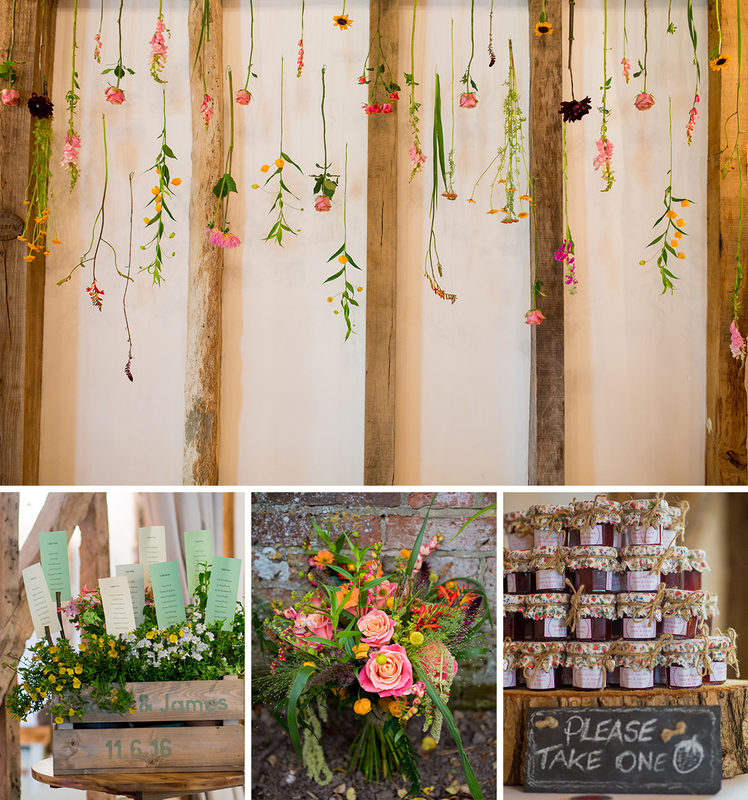 Then check out all the amazing spring wedding decorations that you could incorporate into your special day!